The last day of August is here! The first day of fall is a little ways off but with slightly cooler temperatures this week we are thinking about fall salmon fishing! We will have a look at the major river systems; the Stave, Vedder and Squamish in the freshwater section below that should help you plan future trips. The weather this weekend and next week should be in the high teens with a mix of sun and cloud so great weather to get out fishing. Sockeye fishing on the Fraser is still going great but we are expecting a closure on the 4th so check out those details in the regulation update section below. Saltwater fishing continues to be good. 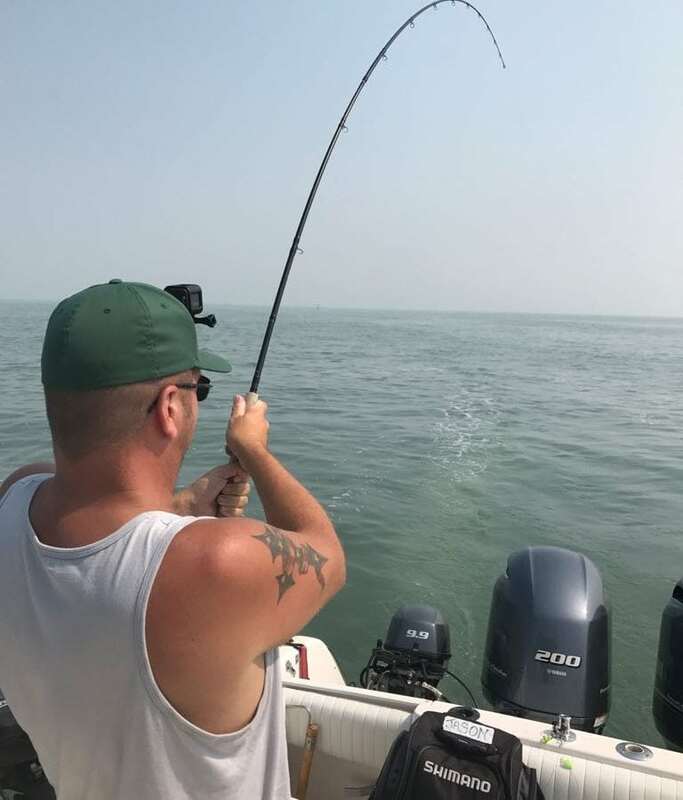 No closures have been announced for sockeye fishing in the ocean as of yet but we would recommend getting out sooner rather than later if that’s what you are after. We’ve been getting into some chinook as well on our trips and looking forward to the start of the Cap fishery. Read on for more details in this week’s saltwater salmon fishing report. Back to school is just around the corner and we are excited to get back into the classroom. Be sure to check out our great lineup of September classes. Monday September 3 – Closed – we’ll see you on the water! Remains open at this time until further notice. The latest we have heard is there will be some decisions made on Tuesday, September 4th regarding further tidal water opportunities for sockeye and that it will likely close sometime late next week, perhaps on the 7th. If test sets are low it could close sooner. Tidal waters of the Fraser River (downstream edge of the CPR Bridge at Mission to the mouth). You may not fish for Sockeye salmon. You may not fish for coho salmon. You may not use bait when fishing for salmon. You may selectively fish for the following species: Chinook salmon, the daily limit is four (4) with only one (1) greater than 62 cm. Chum salmon, the daily limit is four (4) per day. Daily Limits: The daily limit for all species of Pacific salmon from tidal and fresh waters combined is four (4). Individual species limits also apply. Fraser River waters in Region 2(non-tidal waters of the Fraser River); and that portion of the Harrison River downstream of the Highway 7 Bridge to the confluence with the Fraser River. Effective September 5 until September 28, 2018: You may not fish for Sockeye salmon. You may not fish for Coho salmon. 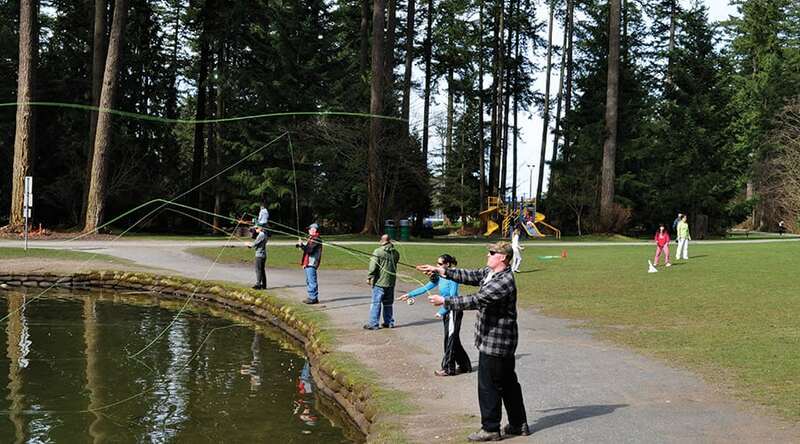 You may not use bait when fishing for salmon. You may selectively fish for the following species: Chinook salmon, the daily limit is four (4) with only one (1) greater than 62 cm. Chum salmon, the daily limit is four (4) per day. Daily Limits: The daily limit for all species of Pacific salmon from tidal and fresh waters combined is four (4). Individual species limits also apply. The kids are back in school next week and we are looking forward to getting back in the classroom as well after taking August off. Join us for some of our great classes this month! There is no greater satisfaction than catching a fish with a fly you tied yourself. 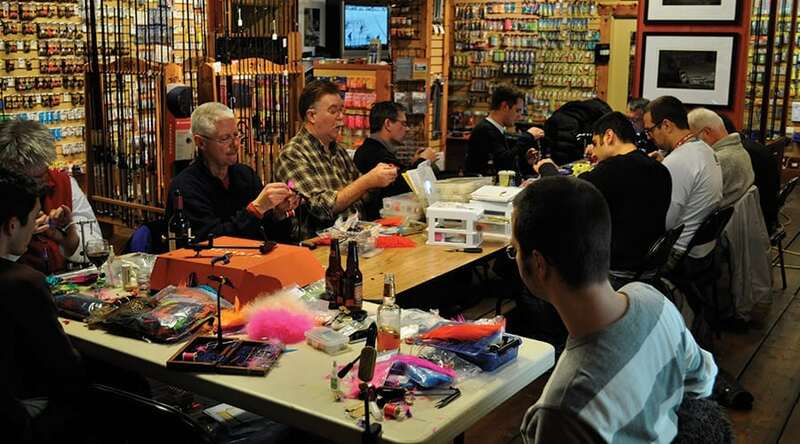 This Introduction to Fly Tying course was specifically designed to give you the fundamental skills needed to tie proven fly patterns used here in BC for trout, salmon and steelhead. Students are required to supply their own vise, tools and materials. A 10% discount is available on fly tying materials and tools purchased for the course. This course consists of 3 sessions; each session is 3hrs. Seminar: October 2, 2018 – NOTE NEW DATE! The Fall salmon season is right around the corner! 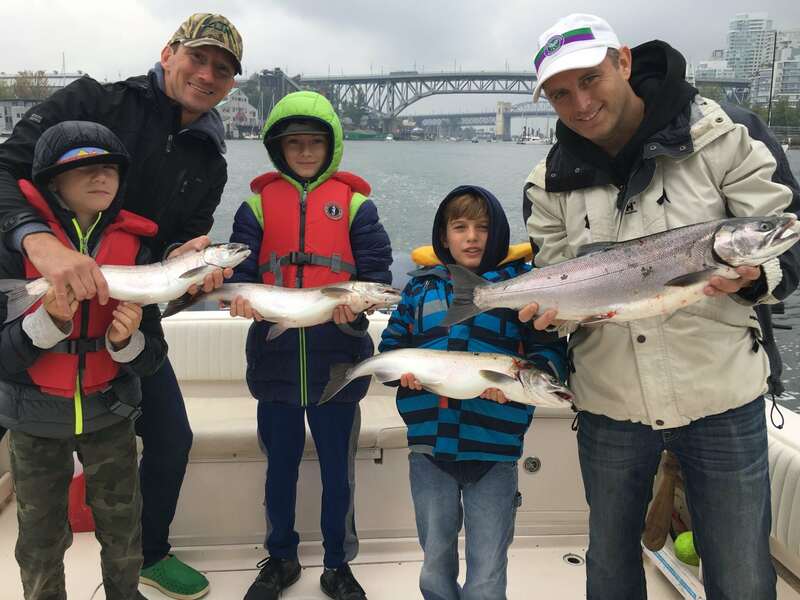 The Vedder is the big freshwater fishery in the Lower Mainland and for good reason; there are lots of fish that show up throughout September and October. 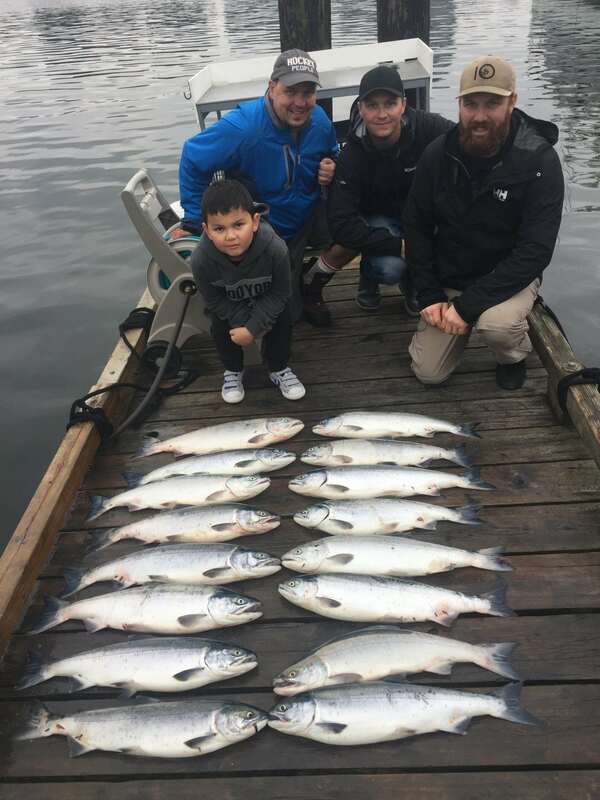 The three main species of note are the chinook, coho, and chum salmon that enter the river during these months and it can make for absolutely spectacular fishing. Coho are typically found in the river the longest, with the earliest fish coming in right now with the run tapering off at the end of November. The chinook will also start trickling in now and taper off by November. Chum will enter the river starting in the end of September and, like the coho and chinook, will taper off in November. There are definitely clean late fish that push in in December but these are exceptions to the bulk of the run. How does one go about catching these prized salmon? You can pretty much use any method and get them, but I will highlight a few favourite methods that will produce. Feel free to experiment too; on a river as popular as the Vedder it isn’t a bad thing to throw something different at these fish. The vast majority of anglers on this river will be drift fishing. This consists of a spinning/baitcasting/centerpinning setup in the 9′-12′ range, appropriately weighted floats, and a bait or artificial lure. A few popular presentations are pro-cured roe, pro-cured shrimp, wool ties (cut to look single eggs), colorado blades, and jigs. This is arguably the easiest method to get into and is highly productive. A second setup that many anglers will use is a lure rod. This is usually done on a shorter 8’6″-9’6″ spinning/baitcasting setup and works either as a main or a secondary rod as it compliments a drift setup very well. Lure fishing can be deadly, especially in water where drift fishing is not possible such as slack water. Spoons, spinners, and twitching jigs are all winners and colour/size will vary depending on weather/water conditions. The last method I will touch on is fly fishing. Both single handed and double handed setups will catch fish, though fly fishers will want to be wary as this river does receive a lot of pressure and thus there typically isn’t a ton of room. In saying that I have seen fly fishers absolutely dominate a run, even out-fishing anglers fishing bait and hardware. The lower river (from the Crossing Bridge down) is the most fly-friendly water and swinging bright intruders can elicit hard strikes from fresh fish. In saying that there are definitely a few great holes for flies higher up as well. In the upper reaches try smaller flash flies, muddler minnows, or egg sucking leeches. 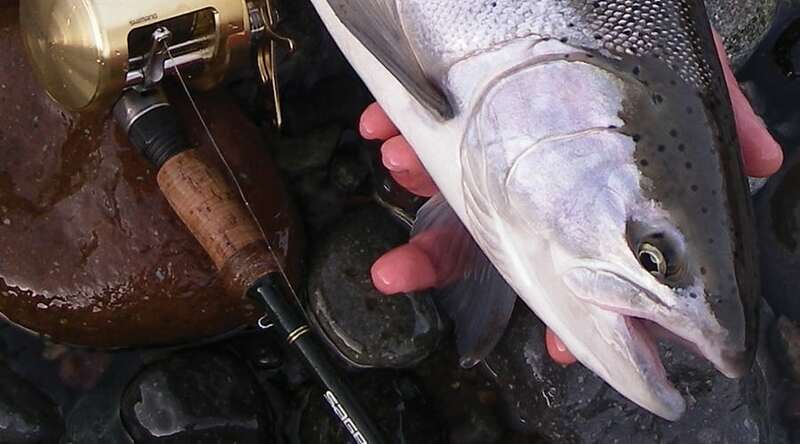 6 through 8 weight single hand rods are ideal for the coho in this river while you will want an 8 or 9 weight rod dedicated for chum or chinook. Sink tips are a must. This is a great river to learn to salmon fish and if done right can be extremely rewarding. Come on in to the Shop to get stocked up or learn how to tackle this fishery with confidence this Fall! We have been watching this one closely but due to its location with it having little impact on any communities (besides us fisherman) there is not much information. On the map it looks as though the fire continues to spread and we heard rumours that crews were going to be moved into the area to assess and possibly fight the fire but we have not been able to find any official news. Access to Silver Lake campground is not impacted, but access beyond the turn-off to Silver Lake on the Silver-Skagit Road is no longer permitted. The closure is in place due to an active wildfire adjacent to Silver-Skagit road at km 35. As it stands we do not expect the river to be accessible and though things can change, a good bet is that we won’t be fishing the Skagit any time soon. If we get more information we will be sure to pass it on in future reports. The Stave River provides a year-round fishery for anglers. It provides anglers the opportunity to target trout and whitefish most time of the year. Seasonally, anglers can target salmon and steelhead and it also provides one of the best chum salmon fisheries in the lower mainland. In short it is a great place to get in some salmon fishing! The salmon run in the Stave generally starts in late September and extends to mid November. The chum run is very big and it is quite common for novice anglers to experience fighting a big salmon on the Stave. For anglers that don’t want to target chum salmon coho can be targeted in slower moving water such as the toilet bowl area. I can’t stress enough the importance of having a proper setup. Chum can destroy gear. For gear guys, drifting rods that are an M power and over 10′ in length is recommended. It is very important to get a natural drift and the long rod length will aid in lifting the line off the water. A baitcasting or centerpin reel is recommended, as these types of reels will let the line out straight with the flow of the water. Spinning setups for float fishing can be used but are not recommended as the line rotates off sideways. If you’re after chum salmon float fishing with jigs is the best method. Spinning setups are recommended for targeting coho. We use spoon, spinners or twitching jigs. Twitching jig can be quite effective in slower water, however twitching jigs where chum are thick will lead to snagged fish and it will be a very hard fight and not ideal. Fly fisherman should have at least and 8wt 9ft. You can get it done with a 7wt for coho however chum is a totally different story. Be sure to use a sink tip line to get down to where the salmon are. Spey fishing is also an option but space is very limited so be sure to keep that in mind. Last week we talked a little about timing on the Squamish. This week we will take a closer look so you guys can start planning your fall fishing. Right now there are fish in the Squamish. You will find bulltrout, resident rainbows and some early salmon. That said we do not consider it a “go to” location until the river clears up a bit. This historically happens when we see the first cold nights. This can be as early as mid September and as late as mid October. There are three major fisheries on the Squamish. The coho fishery is very popular and you can fly fish, spoon fish or float fish for them throughout the river. The second is the chum fishery. This is a favorite of fly angers swinging pink and purple flies or float fishing jigs. We focus on the lower river for chum where we can see fresh silver chum as early as right now but prime time is usually in the middle of October. The last major fishery is the trout fishing for char and resident rainbows. They feed on the eggs of the salmon and we use beads or egg imitation. This is tons of fun with lighter fly rods or float rods. Historically this gets good around the end of the October. We will be writing detailed reports on each specific fishery as we get closer to prime time but it is worth getting out in the next week of two for some scouting. You might find early fish where you can find clearer water around the mouth of tributaries on the lower river. Captain Eddie’s crew with their catch!